Although I much prefer baking to cooking, I’d take a cheeseburger over a piece of cake any day. It’s true. I much prefer savory foods to sweet ones. Don’t get me wrong - I love a good piece of pie, but I can never eat more than just a piece. I don’t like that much sugar. But I love baking. I love measuring things out, following a recipe, all the method that goes into it. Which is weird, because I’m not a very methodical person. 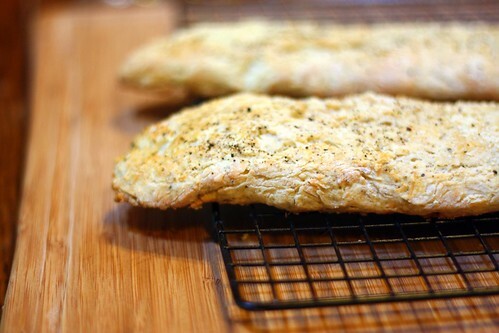 So I always love when I find a recipe for savory baking. They are hard to find, outside of bread making. 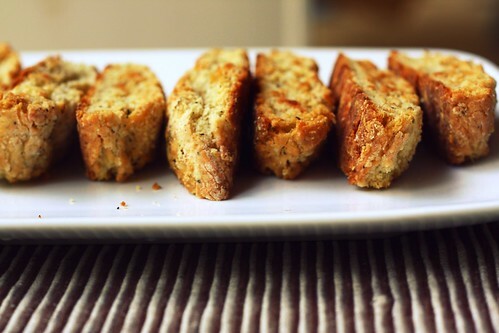 When I can across this recipe for Parmesan Black Pepper Biscotti, I had to make it. I knew I’d love it. This smells absolutely amazing while it’s baking. My mouth was watering. It’s almost like smelling pizza baking. When it came out of the oven the first time, I could help by the taste it. Delicious, it would be perfect to go along with a salad. Then it went in for a second time and came out even better. The crunchiness really works for the flavors. You should make these tonight, they’d be perfect with dinner! 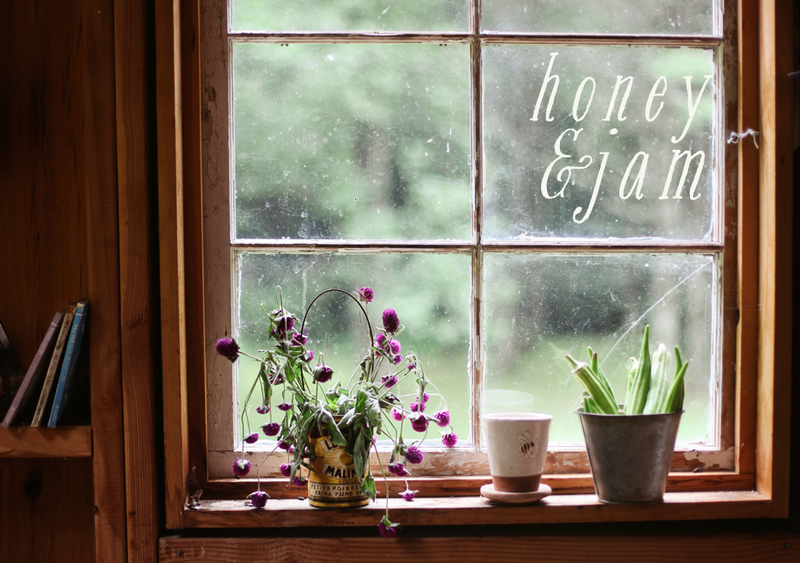 Did you know that Deb at Smitten Kitchen made this same recipe? "It would go perfectly with a salad" - DONE! I needed a bread or something with crunch to go with my fun girls' soup and salad dinner coming up and this is it! Perfect since I can make it a few days ahead too! I feel the same way about sweet things. Give me something salty-crunchy or at least savory and I'm happy. I do like a good dessert, but if it's too sugary, I'd rather skip it. However, I find it much easier to post about baked goods than main dishes. And I do enjoy baking so much. By the time I was done reading your post...I was absolutely craving one of these. I still am. These things look great! You are so young, still such a wonderful work. What gorgeous biscotti! 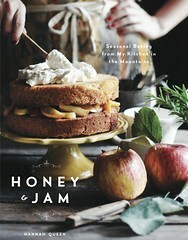 Perfect with a glass of wine! These look delicious. So different! That recipe sounds awesome though, I'll have to give that a try some time! hannah, savory biscotti! genius! these look fantastic. Mmmm, that does sound wonderful. I LOVE fresh cracked pepper! 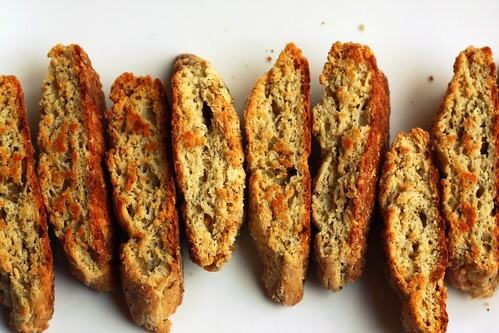 I'm certain that biscotti would taste great with a a lot of savory foods but especially with soups and stews I would think! Thanks for sharing. Wow I normally do not like biscotti but this one sounds delicious! 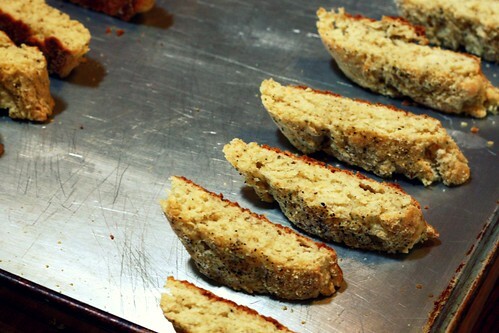 I've never seen a savory biscotti before!